I&apos;m trying to see how fast the Feather WICED ADC can go. 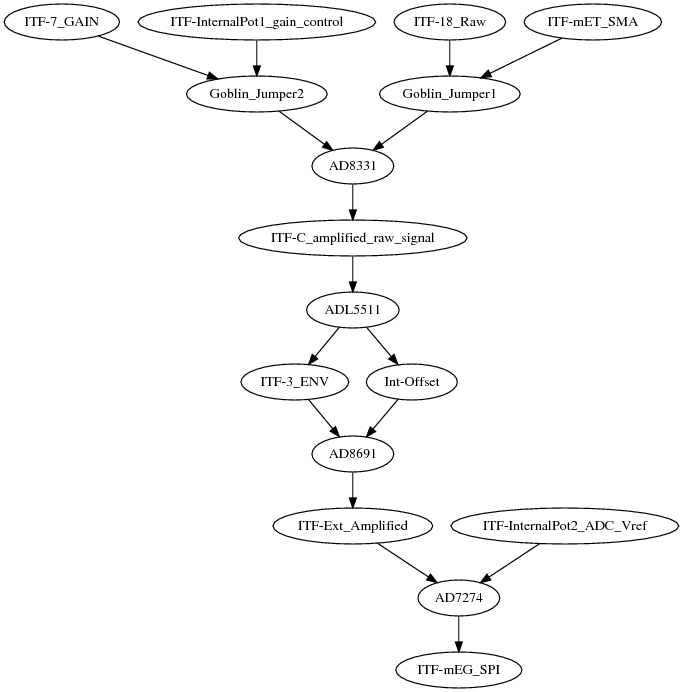 I&apos;ve been trying with analogRead(), and at first sight, I&apos;m getting data at around 50ksps. Will be posting the raw data later on to support this. Now, I&apos;ve begun digging into the maple ADC and corresponding code, and I&apos;ve put together a piece of code to test acquisition speed. This code compiles nicely, but doesn&apos;t work (nothing on serial). I&apos;m unsure of the reason behind this, and I guess some registers need to be finetuned. 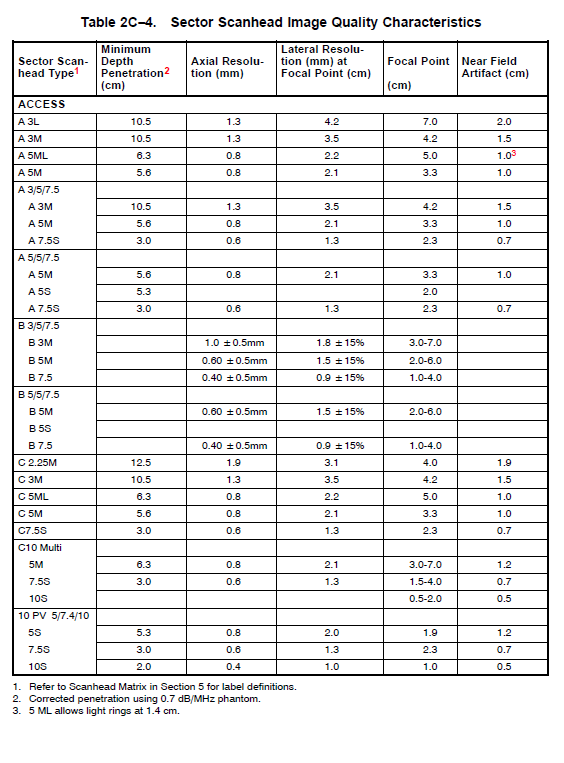 For example, the enumeration for STM32F1 differs from STM32F2, as said by leaflab. However, using ADC_SMPR_1_5 during compilation works, but not the actual ADC_SMPR_3. Working on this at the moment, but would appreciate if you had some ideas on what I could do next, I&apos;ll be updating/documenting the issue in the same time. But removing all references to the second ADC (and so .. to the third as well), the code works. Interfacing the feather to a i2c 128x64 oled display, I can see that it takes around 990 us to get 1000 samples. That&apos;s a bit more than 1Msps - and it should be enough to get a signal coming from the emulator. Moreover, with this working, we can see that the input signal coming from 0 to 3.3V gives 0 to 4095.. as expected. 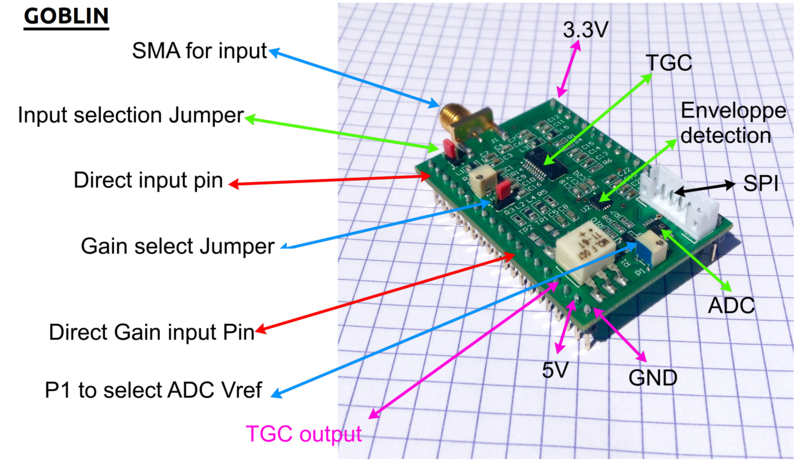 Since the output of Goblin is up to 3.3V, it means I can connect goblin&apos;s output to this one, and try to trig on the same trigger as the emulator as well. Will need a level shifter. Been putting the trig on the 5V trigger from the pulser. Works better. Also doing some averaging.. need to check if it really works. It seems like for 2048 points buffer, only 4 full periods of the pulser are present. This pulser working at 300us intervals, this would put the acquisition at 1.7Msps. Need to check what is really the speed of this acquisition. The code is here ADC2UDP-Cleaning.ino. I got 24x128 points (data is here, decimated 128 times: and I see 22.2 decimated points for a period of 300us. Thats 533 points per period. 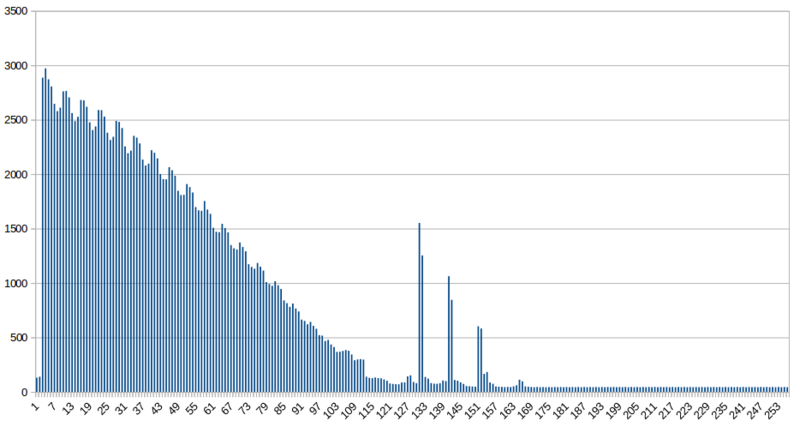 Since it&apos;s a 300us period, the overall acquisition speed is close to 1.776Msps at 12 bits, using only one ADC. Comparing with the source signal, it seems that we are late on acquisition: the trigger took some time. Peaks on the 3 smaller peaks afterwards are on points 82, 88 and 95. 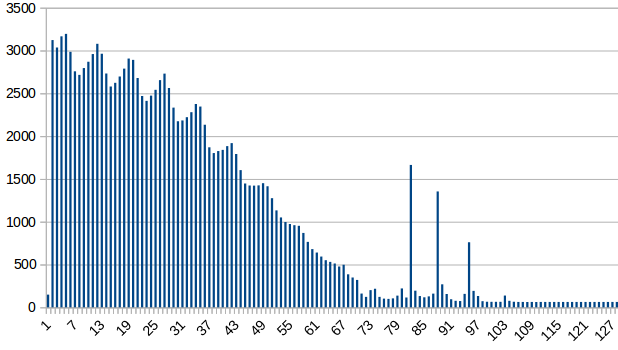 That&apos;s 6.5 points on average between each, or 3.66 us between each peak. 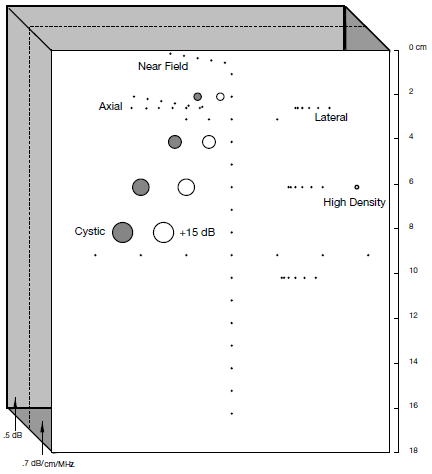 In the config of Silent, we see that each is separated by roughly 7 us. That would mean the ADC speed varies. Needs to be explored. The peaks get better resolved. Data is here -and Arduino code is here. Roughly doubling the sampling rate. The following acquisition was done with an old mechanical ultrasound probe, along with the pulser module, the analog processing module. 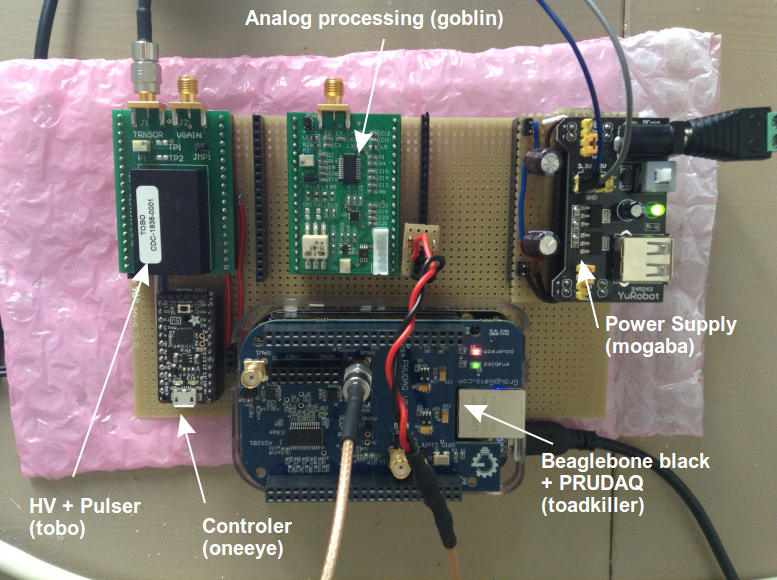 The acquisition was done with a beaglebone PRUDAQ at 10Msps. I&apos;m not mentionning the power supply module. You can download the raw data at using this link. I guess the points we see are the points on the left hand of the fantom. The top of the fantom is not seen as the near field artifact is at goes till around 2cm (according to the probe specs). This matches with what we&apos;re seeing. The pulser module, Tobo, was received. All key signals are accessible, and jumpers, as well as pots, enable on-board fine-tuning of the signals. 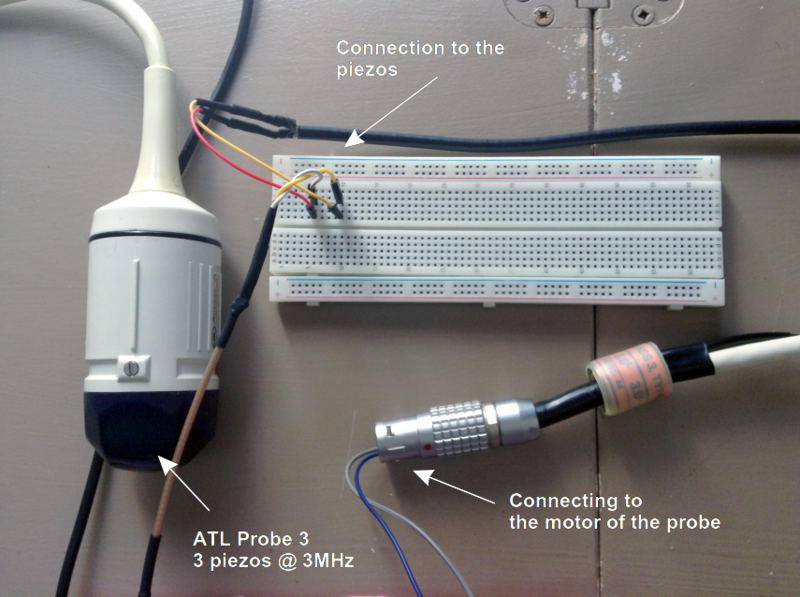 See more details on the testing session, to see the behavior of the board on a oscillo. __Beware, this session had a poor energy supply quality, so the 5V got quite low. The new log, covers it better. Just after the TGC : A 60mV signal becomes a 300mV signal. Which becomes, after enveloppe detection, a 400mV enveloppe. 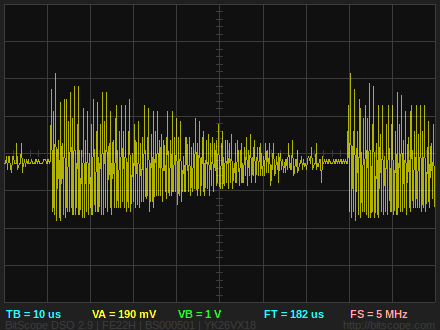 Likewise, a 120mVpp signal becomes a 750mV enveloppe, clean. All key signals are accessible, and jumpers, as well as pots, enable on-board fine-tuning of the signals. See more details on the testing session, to see the behavior of the board on a oscillo. Difference between enveloppe and ADC input? 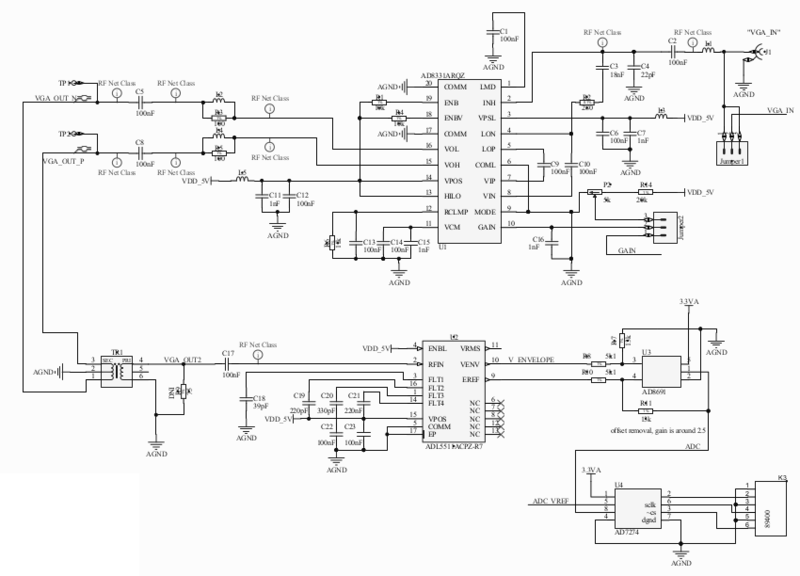 -> the offset is removed, there&apos;s also a small gain (x2). See below: there&apos;s an offset at the enveloppe detection (~RMS), which is removed. Enveloppe is 500mV before, comes at 1V+ afterwards. This was sent through track #18 to Tobo for enveloppe detection.